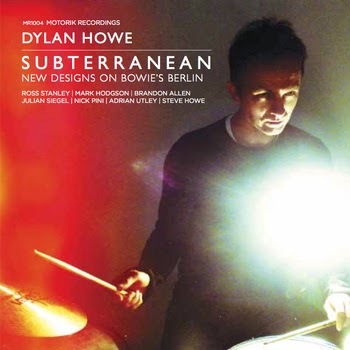 Subterranean is drummer Dylan Howe’s take on David Bowie’s Berlin trilogy (Station to Station, Low and Heroes). In the mid seventies the Thin White Duke relocated from Mars to Berlin and in so doing ‘reinvented’ himself. The kitsch glam look ditched in favour of the Armani suit, Mr Jones at a stroke alienated long-time fans who didn’t get soul. A few years on, Tin Machine was, for some, the final straw. Howe’s band (plus guests on several tracks) is comprised of bona fide jazz players and the playing is exemplary. Is the material of interest to the ‘jazz’ listener? At times it is. Tracks three and seven should be heard. All Saints opens with bassist Mark Hodgson, Howe fizzes in top gear, Brandon Allen solos on Ross Stanley’s swing time feel and the pianist himself flies. The beginning of Warszawa hints at a requiem before developing into a Coltrane-like sermon delivered by Julian Siegal. Subterranean’s filmic sweep with its ‘ambient’ soundscape (the CD cover photography – Alexanderplatz station, descending underground escalator, railway carriages – suggests a travelogue) is certain to appeal to some. Will Spiders from Mars get it? The jazz listener should take something from it. Dylan Howe’s Subterranean New Designs on Bowie’s Berlin is released on July 7 on Motorik Recordings (MR1004). Howe tours the CD in September with a different line-up (Ross Stanley tours) and a specially made film will be projected during the concert.